Updated Monday March 25, 2019 by Collegesoccer.us. Too many clubs in this country use the Adult System when developing players at a very early age. The focul point, therefore, is winning instead of applying the right building blocks for the proper age. Each year the building blocks adjust and coaches need to have the proper education coupled with experience to apply it. How many teams focus on coordination training at the age of 8 regularly or at all? This wide-spread philosophy candidly hinders systematic player development. The Golden Age, ages 8-12, is the most important time to develop players technically and their 1 on 1 skills. Many clubs fail to take advantage of this precious time. For example, technique should be fully developed by the time a player reaches the age of 13. The result of the Adult System is that many promising players' performance, ages 8-12, start declining shortly after and the ones who did not receive equal attention never received a chance to develop properly. US Soccer published an article that over 70% of youth players quit club soccer by the time they reach the age of 13. Here at the Fussball Academy we developed a training model developing every player! This allows for proper development at every age group whether it is during the Golden Age, or between ages 14-18. "I was always the smallest and skinniest player while growing up. I did not hit a growth spurt and fill out until I was 18. If this Adult System would have been in place in Germany I would have never played for 1. F.C. Kaiserslautern, the German Youth National Teams, become a DI All-American and be drafted to play professional soccer in the US because bigger and stronger players would have received all the attention! ", says Founder Richard Möller. Are the training methods and activities of the past still attractive enough, or is it time for a new approach to children's soccer? The only way to gain the necessary insights for the future is to compare childhood today with childhood a few decades ago. Many coaches, trainers and officials, middle-aged or older, vividly remember childhoods that featured an intact world of physical activity. Numerous playgrounds, forests and riverbanks, meadows and sandpits provided space and a wealth of opportunities for play and movement, where physical condition and a wide range of motion were natural requirements. Neither datebooks nor the influence of the media restricted the activities of the young. Various social groupings such as family, youth groups and sports clubs, where binding values still existed, were focal points for the feelings, problems and interests of young people. In the street soccer once common in countries like Germany, children experienced a world of play that was almost completely free: In small, self-organized soccer games in backyards and on the streets, they acquired enormous skill with the ball. In some versions of the game you could even use your hands. In these diverse ball games, kids developed good technical speed with and without the ball via intensive movement in ever-changing spaces. In short, as we now know, the street soccer of the past was the best and most intensive training for young soccer players, the basis of the athletic and technical qualities of players. Without the regiment influence of adults, children organized and adapted their soccer games independently. This also contributed significantly to their personal development. These were the most important characteristics of the street soccer of the past. Children experienced a world of free play, with minimal effort and expense, in the open squares, street, parks and fields. Since the middle of the 20th century, construction has encroached more and more on the spaces available to children for physical activity, often reducing them to poorly equipped playgrounds. Urbanization has accelerated dramatically, erasing the path to the old playing fields. "Keep Off" signs decorate open spaces housing complexes, and athletic fields surrounded by high chain-link fences are often limits if you are not on the schedule. The increase in street traffic has an additional effect: For many children, the preferred place to play is (or has to be) within their own four walls. Playing in the streets gives way to domesticity, leading to a "compartmentalization" of life. Homework, music lessons, computer games and internet surfing significantly restrict the time available for physical activity. Studies of leisure activities among the very young have shown that some kids sit in front of the television as many as 30 hours per week. Holistic, active, primary experiences are being increasingly replaced by a passive, consumer-style acquisition of things and of the world. Insufficient activity and the resulting lack of physical versatility are further reinforced by the fact that children ride even short distances in the car. And the continuing reduction of physical education in the schools also makes for less time spent actively. Of course these facts cannot be generalized. Outside the cities, we do still find the necessary space for physical activity, and there are lots of kids there who spend much less time in front of the television. Nevertheless, studies show evidence of an alarming trend: Between school, homework, the car, meals, TV/computer and non-active games, a nine-year old spends 35 to 40 hours a week sitting. And that number is going up! The consequences are clear, and alarming. Children experience a permanent loss of creativity, autonomy and opportunities for self-organized sports! Children's soccer is not adult soccer! The focus is not on the needs and interests of the children. Many practice activities are not appropriate for children (e.g. too monotonous). The kids are under the external control of score-oriented coaches and players; they are unable to play freely and without interference. 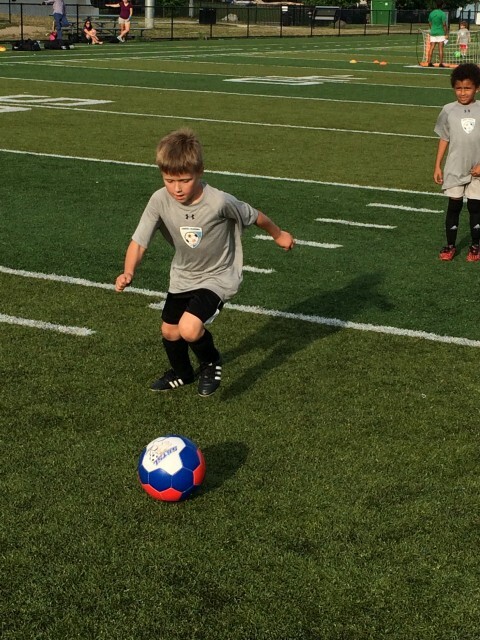 Children's soccer has objectives and methods all its own. Today it is a rarity, but nice it was common in much of the world: In the backyards, in the country fields, in the city park - wherever there was a little room to play, soccer-loving boys and girls kicked the ball. No matter where kids got together, it was not long before two teams were picked. Special rules always made for exciting games. Balls (and ball-like objects) were widely diverse: big balls or small balls, tennis balls, cans - as long as you could kick it around, you had a game. In this way, kids acquired enormous skills with the ball. MFC offers unstructured games during practice, and "street soccer" at our club. MFC provides the freedom to try things out at practice. MFC uses attractive "street soccer" games to motivate kids to kick around with their friends in their free time. MFC does not manage every detail; we let kids be creative! Many of the "prodigies" who performed exceptionally at the U10 or U12 level are no longer able to achieve their full potential at higher levels. Many players turn their backs on their clubs, on soccer or on sports altogether just before they reach the adult level, more and more as early as U14 (dropout problem; US soccer came out with a statistic stating over 80% dropout before they turn 14). Children's soccer is frequently dominated by tactics training, much too soon and too one-sidely. Important basic coordination skills are neglected. First we have to ask ourselves: What are children like? What do they want? In the street soccer of the past, kids organized their own games the way they wanted. Today our job is to share the excitement of soccer with children by offering the same kind of "free soccer" in our clubs. The coordination problems caused by the restriction of children's physical activity must be remedied. Therefore we must emphasize a well-rounded basic athletic program with a focus on coordination training. The aim of every children's soccer division should be not to win games, but to develop and promote every player. Every child is equally important! Player guidance must not be restricted to practice and match play. Non-soccer-related activities like weekend trips, camping and other group activities should automatically be part of the program. Children's development - not just athletic development, but general personal development - should be a major focus for responsible youth coaches. final score positive experiences and learning for all children!